I guess I never realized that free fruit at a gym wasn’t common until you all commented on it today. They usually have a big basket of fruit that the local farmer’s drop off each day and you get to take one piece. I LOVE it for times when you are starving after a workout. 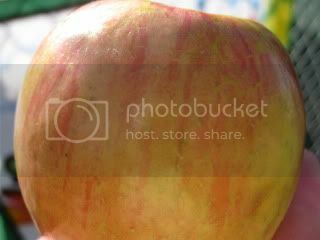 I ended up eating the fuji apple I picked up while at the baseball game. Amazingly crisp and it totally held me over until our dinner at 8:40 tonight. I am so glad that dinner was an quick and easy meal because I was short on time. We started out with a Mushroom & Spinach Soup that doesn’t look pretty but it was tasty. 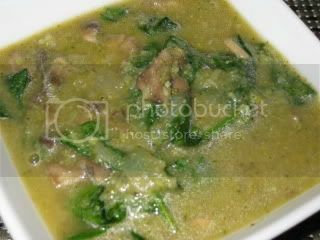 I didn’t puree the spinach and mushrooms so we had some nice chunks in the soup. I liked the soup last night better, but, this still was very filling and it’s 0 Weight Watcher Points. Get the recipe for this soup by clicking HERE. 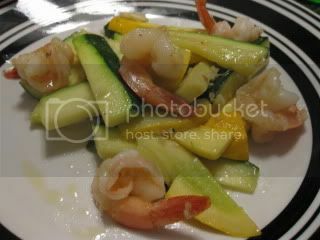 Next up was the Fast Shrimp & Zucchini Stir Fry! I have to say this was absolutely amazing and I WISH the recipe called for more than 5 shrimp per person. It is a definite keeper and one I’ll repeat as a trade off from my Shrimp Scampi. Sorry for the not so good presentation – I was in a hurry. Heat the oil in a large skillet over medium-high heat. Add the garlic and ginger and cook for about 1 minute. Add the zucchini, shrimp, wine, crushed red pepper, salt and pepper. Cook for about 3-4 minutes or until the shrimp are opaque. Tadah!!! That’s it. 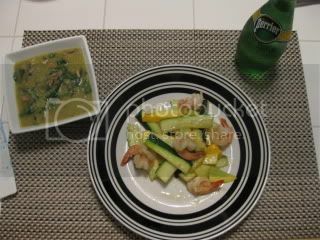 Here was dinner all together with my favorite fizzy water, Perrier. Tonight I had dinner and it rocked! 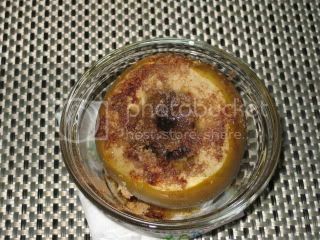 A Baked Apple that was very Apple Pie Like ~ adding some walnuts to this would have been awesome. Core the apple, but, not all the way through, leaving about an inch in the bottom. Peel the top 1/2 inch, sprinkle with a little lemon juice to prevent browing and stuff the top with raisins, brown sugar and a sprinkle of organic unsweetened coconut. Bake at 350 for about 30 minutes and it’s done ~ (3 WWP). Alright, I am off to journal and get to bed so I can get up early and start all over again. I will give you a recap in the AM of day 2. I've never heard of free fruit at the gym, but it is super nice! The farmer's drop it off? That's SWEET! Smart move not pureeing all of the soup. It was way too brothy when we did it last night. Heh…compare your shrimp to mine last night. Kroger had these little teeny shrimp, so I had to double up. Living in a landlocked state has it's disadvantages sometimes! That stirfry looks great, and so does that baked apple! Yum! I've got to make one of those soon. oh i am loving that baked apple! it looks like such a good dessert! and free fruit at the gym?! im moving to cali. TJs and free fruit after a workout, what more do i need? Angelea ~ I LOVED how your soup looked. Maybe I should have pureed the spinach to make it green vs my brownish green color. Dessert was awesome – I need to make sure I don't skip it in the future. K ~ No problem, I'll post the recipe tonight for ya. Anne ~ Do tell if you try it – everything about dinner and dessert was awesome to me. I LOVE this gym, that is why I can't wait all year for the summer special $1 a day!